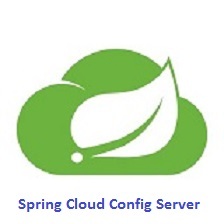 Spring Cloud Config Server is just another Spring Boot application. It provides several infrastructure micro services to centralize access to configuration information backed by a version controlled (well at least in the case of default GIT storage) repository. 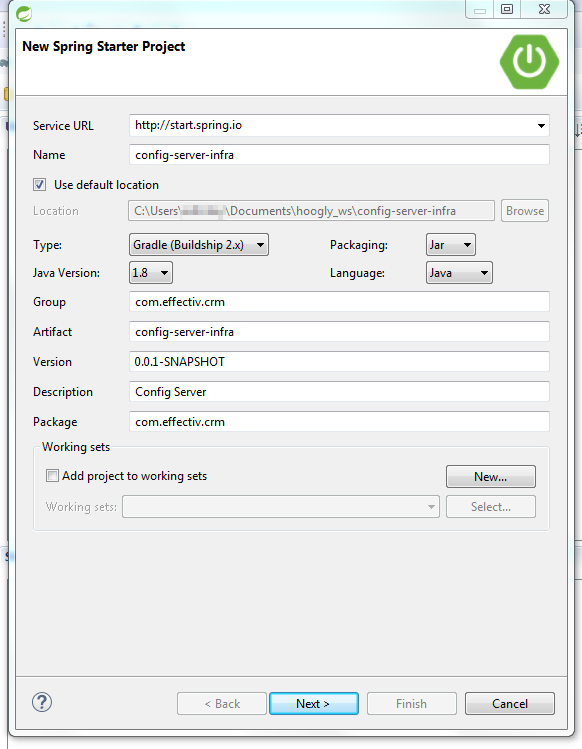 Step 1 - Create a Spring Boot project in STS with the dependencies shown in Figure 2. 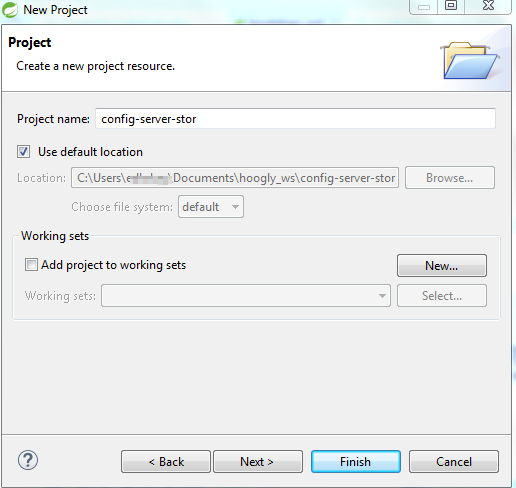 Click on 'Finish' to complete the creation of the Spring Boot project in STS. The build.gradle file is shown in listing below. There is only one dependency to the Spring Cloud Config Server. Also Spring Cloud release train 'Dalston.SR1'. That's all is needed on the Java side to start the configuration server. Step 3 - Final step, create the configuration file. Finally, create a file named bootstrap.yml and configure it as shown in listing below. There are a few things to note in the configuration. The config server uses Github (public GIT repository) to store the configuration information. The configuration is actually stored in the folder 'config-store-infra' specified in the property 'search-paths'. This property actually specifies 'search-paths' a list of folders. For sake of simplicity, I have just configured one folder in this example. However, it is a good practice to use one folder per application/microservice. Note that the Git repository, it is possible to add username and password to provide secure access to the Github repository. But that too has been omitted here to keep the example simple. For more details, I would recommend reading the Spring Cloud config server documentation. The management or security on the config server is disabled. Now run the ConfigServerInfraApplication class as a Spring Boot application from STS and it should start the Spring Cloud Config Server. The config server needs data in the Git(Github in this case) to share with the applications. So for that create a simple project in STS using the steps below. 1> Click on 'File' -> 'New' --> 'Project'. 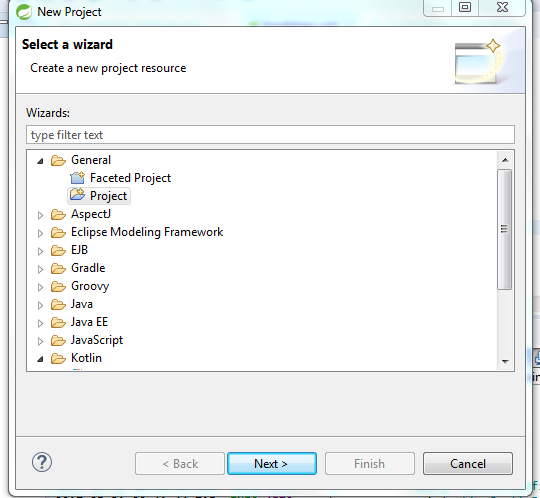 3> In the New Project dialog, type the name of the project and click on 'Finish'. 5> For testing purpose add a simple property in the lead-service-DEV.yml file. 6> Finally commit and push the config-store-infra project on Github repository. The source code for this post is also available on Github location provided below. 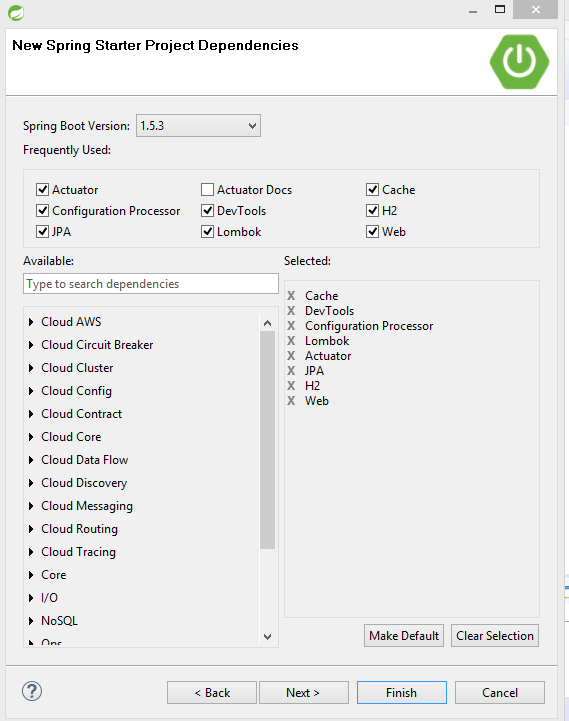 In the next post, I will show how to quickly test the Spring cloud config server using a browser. Then I will review the url patterns to be used for the Spring Cloud config server. I will then change the lead-backend microservice to use the config server. So far I have been using an in-memory H2 database or Mockito for testing the lead microservice. To make the transition towards using the Spring Cloud Config server, I need to upgrade the micro-application to use MariaDB. I will be adding the configuration in the application.yml the file which in the subsequent post will move over to the config server store. I will also be using Flyway to make it easy to maintain the database schema changes in future. I will use this post to introduce Flyway in the mix. Spring Boot also provides first class integration with Flyway. I am using Flyway as its really quick and easy to get started, minimal learning curve (no DSL) and I am comfortable with it having used it in the past. Heidi SQL client is installed. 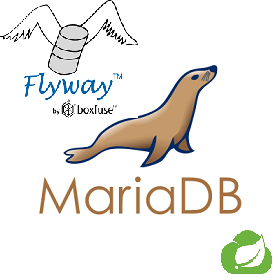 Step 1 - Update build.gradle to include the MariaDB JDBC and Flyway dependencies. Step 2 - Rename the application.properties to application.yml and add the properties shown in listing below. The lead backend service will run on port 8080. The application now has a name - 'lead-service'. This will be required by the configuration server later. I have also setup the MariaDB data source, the default Tomcat connection pool (recommended in Spring Boot documentation and also I do not want to introduce another dependency on a connection pool like Hikari or BoneCP etc as this pool is very robust). Also, I have added the dialect configuration and default schema name for Hibernate/JPA. 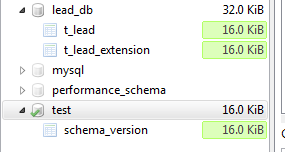 Since I want to use the defaults on the database, Flyway will use the test schema and the Flyway managed DDL script will create the schema for the lead backend as 'lead_db'. Step 3 - Create the DDL scripts for Flyway. The next step is to create the DDL scripts for Flyway. The scripts should be stored with the lead-backend codebase under src/main/resources/db/migration folder. The file that creates the database schema for the first time is named 'V1.0__init.sql'. Note there are 2 '_', between 'V1.0' and 'init'. Check the Tomcat console logs to verify that Flyway and JPA worked without any issues. Finally, check the DB with HeidiSQL if the Flyway table and 'lead_db' schema tables are created by Flyway. Last month I wrote a primer on concepts around 12 factor app. Before getting into the details of the Spring Cloud Config Server, I must refresh on the principle #3 from the list presented in that post. Configuration information must be separate from the source code. This may seem so obvious, but often we are guilty of leaving critical configuration parameters in the scattered in the code. Instead, applications should have environment specific configuration files. The sensitive information like database password or API key should be stored in these environment configuration files in encrypted format. Do not store configuration as part of the deployable unit (in the case of lead microservice - inside the jar or war if you are still deploying war like the good old days). Instead, store it in an external location and make it easily accessible during run-time. Configuration files should be separated based on the environment where the microservice is going to run. For example - it is a common practice to maintain environment-specific configuration files like "DEVELOPMENT", "TEST","STAGING", "PRODUCTION" etc. It is a very common practice to store sensitive information like user id and password for database etc as hard coded in plain text format. It is advised to store such information in environment specific files but in an encrypted format. Change in the configuration should not result in application/service to go through the entire build, test, release and upgrade cycle. So, you may think that you will have to develop a server based configuration management system. Wait, we already have a solution. 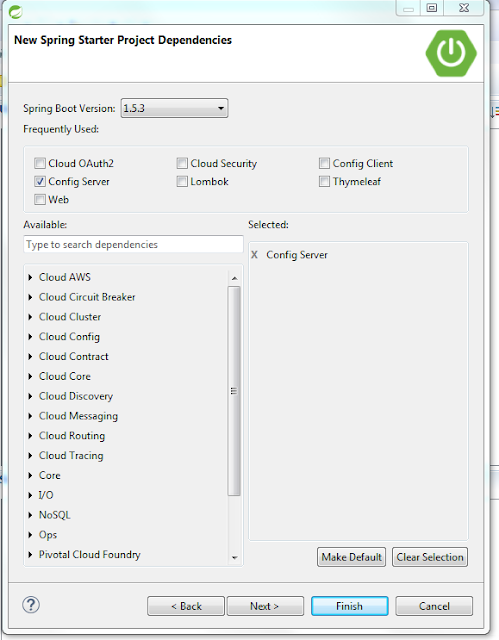 Spring Cloud Config Server solves the problems described above and more. Essentially Spring Cloud Config Server is an infrastructure microservice accessible over HTTP. Enables centralized configuration management for all environments and different applications. Configuration information is stored in repositories managed by the config server. Provides client-side support for applications to access the configuration properties at startup and cache them. Configuration properties can be version controlled depending on the underlying repository support. Any changes to configuration properties/values can be propagated to all the client applications. The client side support allows these changes to be applied transparently / refreshed without the need to restart the application again. Confidential information can be encrypted. Maps to Spring core concepts of Environment, PropertySource, Profile and Value. Thus it is easy to use in Spring applications and microservices. Facilitates continuous delivery pipelines by supporting configuration for different environments. It can be used by applications running in any language as the config server is nothing more than a REST endpoint serving configuration managed by an underlying repository. 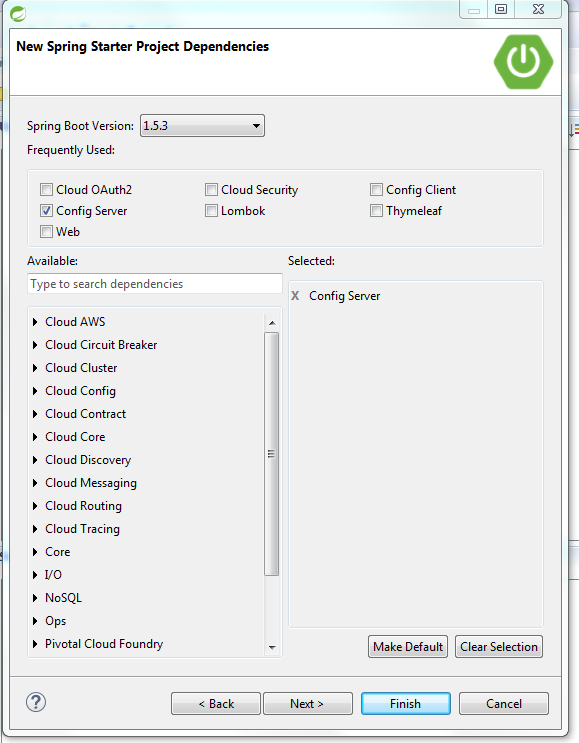 For example.NET clients can also use Spring Cloud Config Server. (More details can be found here - https://steeltoe.io/). Supports Git as the primary storage repository for configuration. However other repositories like a file system, Hashicorp Vault are also supported out of the box. The support for MongoDB is in incubation as of this writing. Monitoring of the config server is also possible. Easy to configure and launch. Properties are not cached on the server side. Each request leads to calls to the backing repository which can lead to multiple remote calls. High availability and failover features are limited. Dynamic update of configuration properties on the server is very cumbersome. Note, that config server is extremely performant unless limited by the underlying store. The benefits overweigh the concerns and hence Spring cloud config server is the recommended tool to manage configuration in the microservices ecosystem. Note that none of these alternatives map to Spring Environment, PropertySource or Profile. Hence it will require a lot of plumbing to provide the features provided by Spring Cloud Config Server. 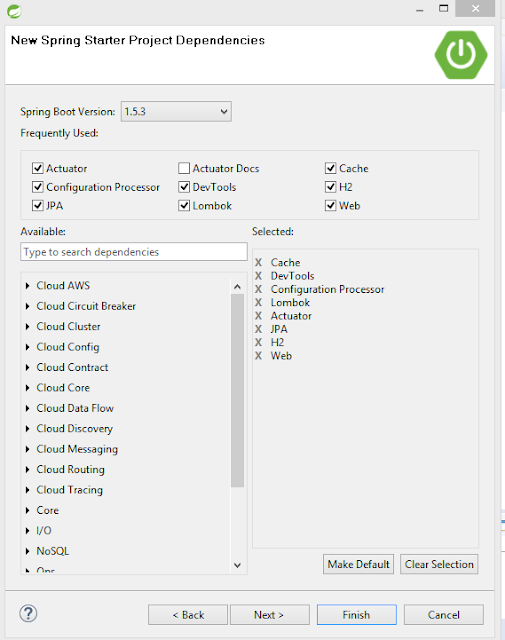 So Spring Cloud Config Server is our tool of choice for configuration data management in the cloud-native architecture. So far I have covered only a few pieces of the Spring cloud-native application architecture jigsaw. I have only written about Spring Boot for microservices development and now I am going to write about Spring Cloud Config Server. I will gradually cover all the boxes in figure 1, to complete all the puzzles in the jigsaw. This post was dedicated to some theory behind, the Spring Cloud Config server. In the next post I will get back to hands-on work again and setup the Spring cloud config server and test it using a simple browser based client. Stay tuned for more exciting stuff. In the previous post, I introduced the unit tests for the repository layer of the lead microservice. In this short post, I will do some cleanup, add all the unit tests. Finally, I replaced all the JUNIT asserts with AssertJ asserts. AssserJ is also recommended by the Spring champions over at Pivotal. AssertJ - provides fluent assertions for Java. Testing improvements in Spring Boot. Ok thats it for now. In the next post I will show how to unit test the business / service layer of the lead microservice. Now that we have completed the first round of development of our lead microservice, it is time to focus on some testing. I will follow a bottom-up approach and start by writing unit tests for the repository layer. 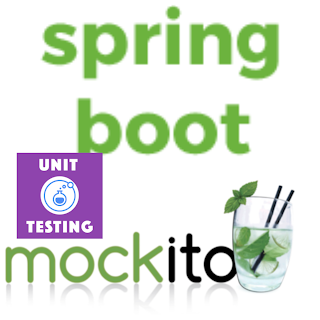 In order to write unit tests, I will make use of the Spring Test Framework and Spring Boot Test support. 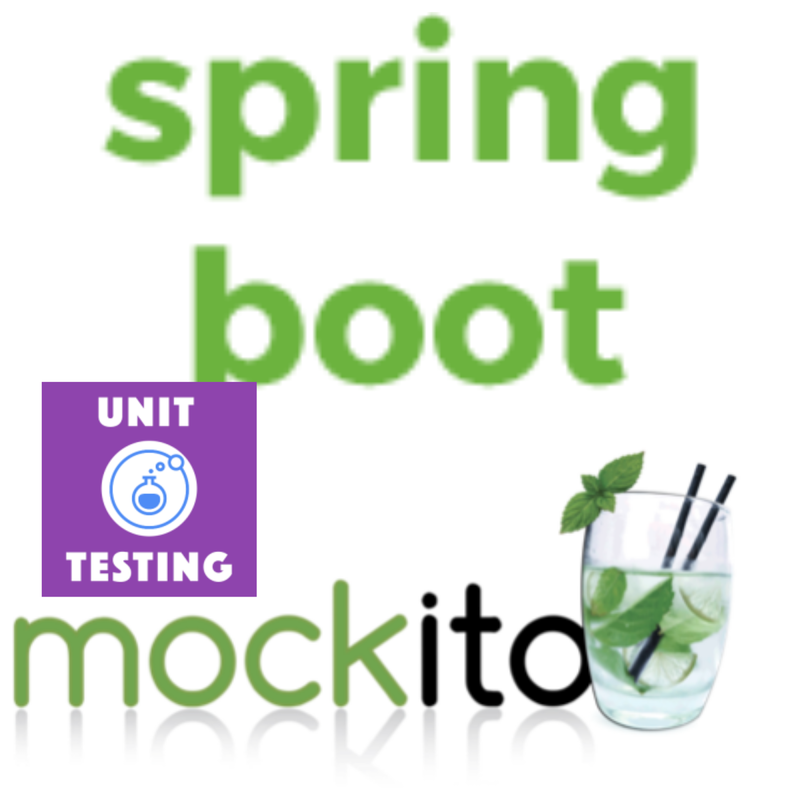 Spring Boot makes it extremely easy to unit test slices of the application. We can use @DataJpaTest and just unit test the database layer with an embedded database like H2. However, there are some gotchas (I do not know exactly what at this moment), the @DataJpaTest does not work if you have extended the Spring Data JPA to add a custom method for all the repositories. The problem I found was that the when running the Spring Boot application, everything works fine and the custom method works fine and the query returns the correct results. However, when the unit test is run, Spring Data JPA fails, complaining that it is not able to find an attribute for the entity/type. So to write unit tests for the repository of the lead microservice, I will use the standard @SpringBootTest annotation. The goal here is to unit test and hence only beans relevant to the repository layer are created. To achieve this we will have to prevent unnecessary beans from being created - for example, the controller beans etc. Remember unit tests have to be cheap and must run fast. This will ensure quick feedback and promote continuous delivery principles. Note that the repository unit tests are created and run in an embedded database and hence they are very fast. Listing 1 - below shows the initial version of the repository unit test class. There are few important items to note in Listing 1. Most of the methods are not yet implemented. They will be implemented along with future posts. @Transactional - annotation ensures that the transaction which started at the beginning of the test method is rolled back after the method completes. In other words, the test data that is created is removed. @SpringBootTest(webEnvironment=WebEnvironment.NONE) - ensures that web environment is not started in other words no controllers or web layer beans are created ensuring that the test runs fast. This project makes it extremely easy to create test data and then clean it up. @DatabaseSetup - can be added both at the class and method level. The transaction starts with the DB setup process and it inserts the data in the lead.xml in this example into the database for easy test data setup. Once the test completes and transaction rolls back, this data is removed. When the annotation is added at the class level, then it is run for all the test methods. It can also be added to individual test methods and in that case, the test data will be loaded only for that particular method. The DbUnitTestExecutionListener will also be required to include Spring-test-db-unit. as shown in the snippet below. 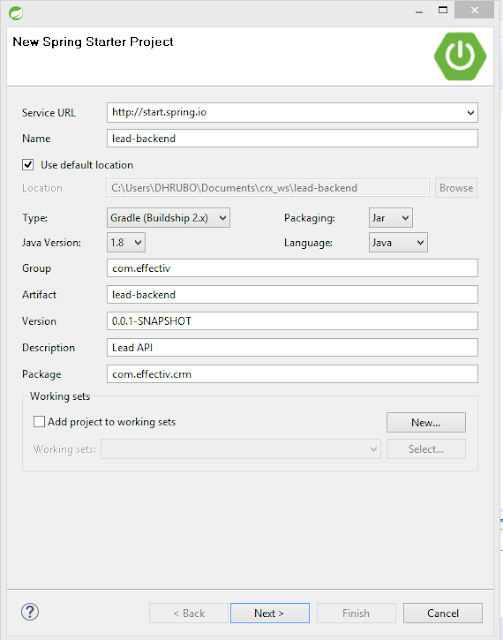 Finally, some changes are required in the build.gradle dependency management section to include the spring-test-dbunit jars in the lead microservice project. This is shown in snippet below. This post continues from the last one. I will try to complete the lead microservice in this post. I will be focusing primarily on the CRUD operation. In CRM applications, that is the primary set of operations. I will start by creating the exception class. Later I would show how to use this exception class and Spring Rest exception handling and build a robust error handling around the API calls. Next step would be to introduce the service class. Since this is CRUD most of the functionality can be encapsulated in an abstract parent service class. Any specific feature like convert lead to opportunity can be implemented in the LeadService class. And then finally the LeadService implementation class is shown in Listing 3. Note that this code will not compile. In order to get this to compile, you will need to add 2 new dependencies for the Jodd libraries. Jodd is a popular micro framework which provides very useful utilities and lightweight framework to develop Java applications. Now I am going to add the Spring Rest controller. This class is responsible for handling all microservices call. It then delegates to the business delegate to complete the business operation. As you must have already noted, the business delegate then calls repository to retrieve any data from the backing data store. In this series, I am using JPA store or my code is interacting with a relational database. Later I intend to add NoSQL store also and show if and how they can reside together. Just like the business delegate most of the functionality is encapsulated in the base controller class as shown in Listing 5. And finally here is the LeadController implementation class in Listing 6. For the time being, I am just going to focus on building the backend and cloud enable it. Then slowly I am going to add the front end and security to the backend and front end. I will also explore the complete Sping Cloud gamut of projects and beyond. I will then deliberate on cloud-native applications, transactions and actually making this application suitable to run on virtually any cloud. I will also explore cloud and microservices application design patterns. Last but not the least we also need to check where this application fits in the maturity model for the 12-factor application. Step 1 - Create a Spring Boot quickstart project using STS. I am using the 64-bit version of STS 3.8.4 on my laptop. File -> New -> Spring Starter Project. In the dialog fill out the data as shown in Figure 1. Then click on 'Next' to fill out the final dialog as shown in Figure 2. Once the final dialog is filled out with the selections click on 'Finish'. Step 2 - Add the Lead domain class. Let's go ahead and add the lead domain class. 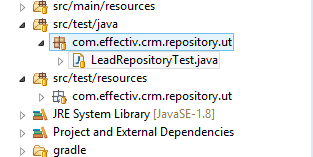 I am assuming some familiarity with Eclipse/STS and will not show how to create a new package or a Java class. The common properties are in the BaseEntity class which is shown in Listing 2. The Address class is embedded in the Lead class. This is shown in Listing 3. I will end the day today by adding the Lead JPA repository. In my previous posts, I have shared some theory regarding microservices. But it's time to start some implementation. I love to write code and see and feel things working. So I will start a series to refactor a monolithic CRM system and transform it into microservices based flexible software. Customer Relationship Management(CRM) is that giant software which existed since time immemorial and is used by all companies in some form or shape. Big enterprises will buy CRM software (also known as packages) from top CRM vendors like Oracle, SAP, Salesforce etc and then employ an army of consultants to try and implement it. Most of the classic CRM systems in the market today, even if deployed on the cloud are the big monolithic ball of mud. They are the gigantic piece of software with the huge feature set. Most often those requirements are surplus to the requirement or they will not fit into the processes of the company. So the company has to hire these certified consultants or "specialists" to either tailor the product or tailor your process to the product. This takes the involvement of a lot of people from business, consultants, developers, architects, and managers over a long period of time. Since so many parties are involved and too many ideas and thoughts, these programs often end in disaster (if not managed properly) after wasting months and even years not to mention the millions of dollars that go down the drain. I have had a couple of such unlucky experience to be part of failures. CRM softwares are monoliths that have evolved over a long period of time. They most use outdated or proprietary technologies and are often closed source for competitive reasons. Even if you get some modern open source CRMs, they are also monoliths and often suffers from the same challenges as the commercial ones. They are also not based on open standards or technologies that leverage modern hardware. Most of the open source CRMs, for example, are written in PHP which is not always best suited to leverage, for example, the power of multi-core CPUs. Hence it can be challenging in terms of performance and scaling. CRM or such packaged softwares mean long term commitment to a vendor. Even if you run the newer version of these tools, you still are completely locked into the mercy of this vendor and its cloud offerings. You still haplessly pay software and cloud hardware cost. This bill can be a significant dent to the overall IT budget and thus limit spends in R&D. This also makes integration with other custom or COTs product extremely challenging. Also, you have to train and work in the proprietary technologies used by the CRM vendors. Competent resources on such technologies are hard to find and even if you find someone it's going to be very expensive. Often the commercial or the open source CRM products lack flexibility. You cannot pick and choose the modules you need. Neither you can run on your favorite cloud. Now that we know some of the key challenges of CRM softwares let us first understand the key modules that make up a CRM software. I will try to keep this as simple as possible for easy of explanation and understanding. The goal is not to overwhelm you with business or domain knowledge but to see how to break down CRM monoliths and see if it can leverage the flexibility of microservices. The number of modules can vary and some CRMs have additional modules but in general, the ones listed above are the most common set of modules. For the sake of simplicity, we will consider the first 2 modules in our example tiny CRM and build the monolith version in the next post. The CRM—or Customer Relationship Management—tool is an often-encountered beast that can instill fear in the heart of even the hardiest architect. This sector, as typified by vendors like Salesforce or SAP, is rife with examples of tools that try to do everything for you. This can lead to the tool itself becoming a single point of failure, and a tangled knot of dependencies. Many implementations of CRM tools I have seen are among the best examples of adhesive (as opposed to cohesive) services. The scope of such a tool typically starts small, but over time it becomes an increasingly important part of how your organization works. The problem is that the direction and choices made around this now-vital system are often made by the tool vendor itself, not by you. In next few posts, I will try to build a modern CRM based on microservices architecture. The 12-factor app guideline was published by Heroku the platform as a service (PaaS) provider (now a part of Salesforce.com). These were a set of principles/best practices that one needed to follow to build applications on the Heroku PaaS. Over time, this has become the de-facto standard for building web applications on the cloud or more precisely cloud-native applications. The original 12-factor app guideline is available at 12factor.net and was not really meant for microservices. In this post, I will try to go over the 12-factor app guidelines and check how they fit into microservices architecture. The application codebase should be maintained in a version control system (VCS).All developers should have easy access to VCS.There is only one codebase per application in the VCS, but there can be multiple deployment copies of this application codebase. For example, an application can be deployed in different environments in a typical CI pipeline - pre-production, user acceptance, production etc. These environments have the codebase for the same application but they can be in different state or version. The pre-production can be few commits ahead of the code that is currently running in production. All web applications rely on external libraries(notably the framework libraries/jars) to run. There is high chance that the target deployment/server environment (say your web server) may not have the dependent libraries/jars. Hence the web application must declare all dependencies with the correct versions. These dependencies can then be included in the web server as part of the deployable unit. An application connects to backend services over the network. Backend service can be databases like MySQL, MariaDB, distributed caching based on Redis, Hazelcast etc, NoSQL stores like MongoDB. Applications typically use connection strings/URL formats to connect to these systems. If these servers are moved to a different node or new node comes up, the connection details of that backend service will change. The application should able to handle such changes without any code changes, rebuilds, and redeployments. These connection settings should be part of the configuration. Another example would be moving the application from pre-production to production. In this case, also the connection settings for database server will definitely differ. The code should be able to detect the environment profile and function as expected without any change. This principle states that build, release and run stages should be treated separately. During the build phase is the developer is in charge. This is where feature/capability branches are created, development is done, tests are run and finally merged to integration/develop branch. In the release stage the software is prepared for a possible release to production, - may be a release candidate or general availability version. The regression tests and other tests would be run to verify if the software can behave as defined in the specification and can be deployed/pushed to production. The actual production release is also tagged.Finally, in the run stage, the application is actually pushed to production or is deployed. It should then run without any intervention or modification. In case a bug is detected in production or a new feature comes along, it has to be addressed all the way back in the build stage after detailed analysis. This disciplined approach minimizes risk, creates traceability and establishes a well-oiled process. This is evident that automation around agile CI/CD process will be key to implementing this guideline. This guideline suggests building stateless web applications. These applications are easy to scale, upgrade. The application state is only stored in backend stores like databases. Also, his is kind of a warning that too much session state and sharing it in a cluster is not a best practice. The application services are accessible (securely to the external world) using URL exposed over HTTP protocol. The application should be run one process on the OS. That process can then scale out horizontally across multiple nodes. The application must startup fast. In the case of a new deployment or upgrade, this should not take hours. In the case of a crash, new spawning a new node and bringing the application up on the new node, should not take more than a few minutes. The application instance must be capable of handling graceful shutdown without impacting overall scalability (#8) and jeopardizing the backing stores (#4). Also while starting down and shutting down, the application must send notifications to the monitoring tools on the network. It is evident that this principle indirectly points to cloud deployments backed by continuous deployment/CI/CD pipeline. I would put it differently. I do not think your development environment needs to mimic your staging and production. However then you should ensure that the application is packaged with a good build tool with robust dependency management in place. Instead, your build and staging environments should resemble production as close as possible. That implies having the exact same version of the operating system, virtualization, databases and any other relevant services.This helps shorter cycles to unearth infrastructure/environment related issues. Such bugs can be nasty, discovered late and can cause a lot of frustration and consume time to fix them. Also, there is lot more confidence going towards production as you know you have already run the application in exactly same kind of environment for staging. This guideline again has deep consequences for classical applications. I will explain this in the next post. After an application is deployed and goes live in production, then it needs to be monitored and managed. You may want to change certain internal parameters via JMX for example, restart one backing server instance, delete some useless files etc. In production, such tasks should be run separately / in a separate process than the actual application. 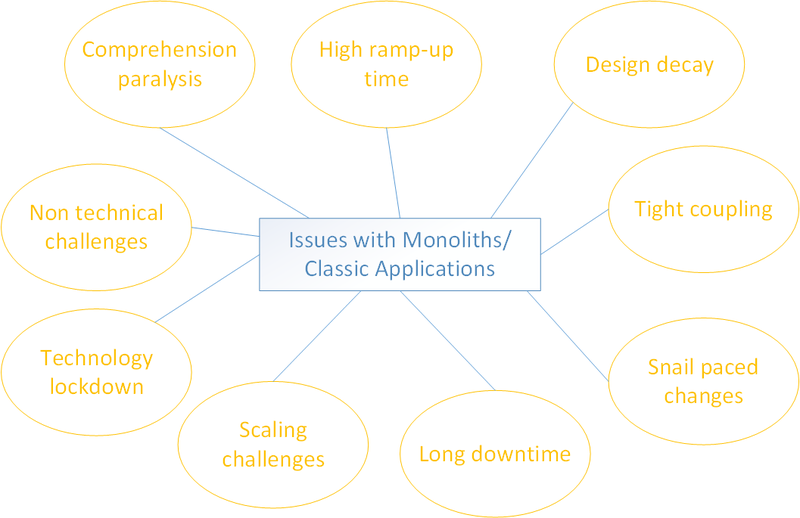 So whats wrong with Classic Applications a.k.a Monoliths? 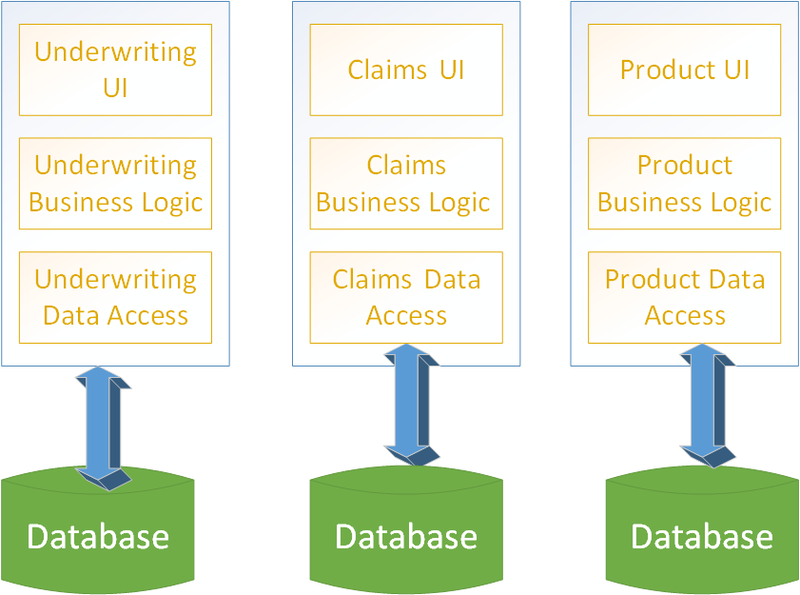 In my previous post introducing microservices, I wrote about this insurance product I was working on at the beginning of my IT career. It started off very simple as a layered application. Well it was not simple, the learning curve with J2EE of that time was indeed high. Just like microservices, it was all shiny new thing. The application started with just a couple of us. Then we started adding features. The product was sold. I was happy, I went to install and implement it at customer sites. It was fun. Then customers demanded more and more features. New features were also required to address new business challenges and compete with established players. So we kept adding more bricks and mortar on that same structure. 2+ years flew by and I realized that we have about 20 odd modules, 500+ tables, and nearly a team of 100+. We had several customers in the US and elsewhere using this product. It was really a big success in such a short span of time. But I also realized that I don't fully understand the system anymore. I had no clue about for example what the product module was doing, neither I understood the re-insurance module. Also, I could observe that new team members struggled to get on board. If learning EJB was not overwhelming enough, the size of the code base scared them. Changes were now difficult and time-consuming affair. For example making a change in the product module, you also needed to ensure nothing break in other modules.This meant several long meetings. Even if we ensure everything was all right and put several features together for next release, something or the other would break. This would lead to slow deployment and longer deployment times. I have already described the challenges in scaling this application in my previous post. In short, as the application created based on classic architecture makes it extremely difficult to maintain, change and operate as it grows big over a period of time. I have many such stories and experiences of large classical applications becoming obese and fatigued over time. A short summary of issues with large classic applications. It is extremely difficult to comprehend each and every aspect of a large application codebase. This is true even if you are working on it from Day 0 on that application. As the application grows bigger and bigger it becomes next to impossible for one developer/designer to know everything. This is a fall out of the comprehension paralysis. New developers would take months instead of a couple of days/weeks to come out to speed. Even if they did come up to speed, they would never feel assured, barring a few exceptions though. Since all the modules are seating together in one code base they are very tightly coupled. Some or the other concern would sneak in across module boundaries. Due to the tight coupling, the team would spend hours in figuring out how to ensure that a change in one module is not going to break another. This can be a sign of collaboration, but a big impediment to progress. Team members, designers, and architects would then argue for hours and days to conclude on the best way forward to implement a change. CI/CD did not exist in 2001. Assume it did for a minute. Even in that case, the slow changes and gigantic code base would make it extremely difficult. The development was slow (Visual Age, Bea IDEs ran slowly with the large code base and it was the time of costly memory, we had only 512MB/1GB on developer workstations), there were several tests so it was not possible to get quick feedback. This also meant loss of developer productivity. It is an absolute nightmare to do capacity planning for such large systems.As I explained before, even if you know which parts to scale more than the others, but due to the tight coupling, you cannot do anything about it i.e scale selectively with optimal hardware. In such tightly coupled or "monoliths" you could be forever locked with some specific technology and server and some vendors. Over a period of time, new and better technologies, languages come up. Even if you know they are better, even if you know you can or should make the switch two things will prevent you from doing so. First is the inertia especially from management and development group both. It's working and running let it run. Second is the cost of such a switch can be very very expensive and there is no sponsor for that. Some people would know the system and code better than others. They would take management by the gun point when it came to appraisal, raise and bonus. I am not joking it's true. The whole idea of microservices revolves around building a large application from a set of small modules which are composed around business functions.Let me share one concrete example to understand this better. Figure 1, shows the classic layered architecture that I was introduced to back in 2001 when I was building a large product for the insurance providers. This application was also modular, but horizontally.So that ear file contained everything – the UI, business logic, the data access logic for all the insurance business functions – underwriting, claims, product, accounting, party, agents, reinsurance etc. We had one big “earball” that would be built and thrown in the application server. Now in India, people tend to buy a lot of life insurance towards the end of the financial year (in the month of March) as it allows them to save taxes. So, for last few weeks in the month of March, there would be a lot of stress on the underwriters. This, in turn, means the underwriting module (and few other related ones like the product, accounting, party etc) is being heavily used in those few weeks. I am assuming the normal volume of claims during that period. In order to handle the high load, the application had to be scaled mostly horizontally. That means new nodes would be procured in the data center, the application server will be installed and the same “earball” would be thrown at them. In summary, we would scale the entire application and not just the underwriting components. Given that this product’s codebase was very large and complex, a significant amount of hardware would be required across the server nodes to scale. For sake of simplicity let’s assume that this hardware size to be ‘X’. This scaling demand on the system would reduce after 31st March. So the additional servers and nodes will be redundant. However, it is not so easy to get rid of this hardware. Some companies would try to re-use the boxes for some other purpose. But that is also a time-consuming affair. In most cases, the company bleeds financially as hardware seats in the data center without any use. In order to ensure that only underwriting component is scaled, it is required that is deployed separately from the rest of the application components. Now, what if an unforeseen situation happens and then there is increased activity in the claims department. Ok, let us break apart the claims module. Product management module being common to both underwriting and claims. What would you do? 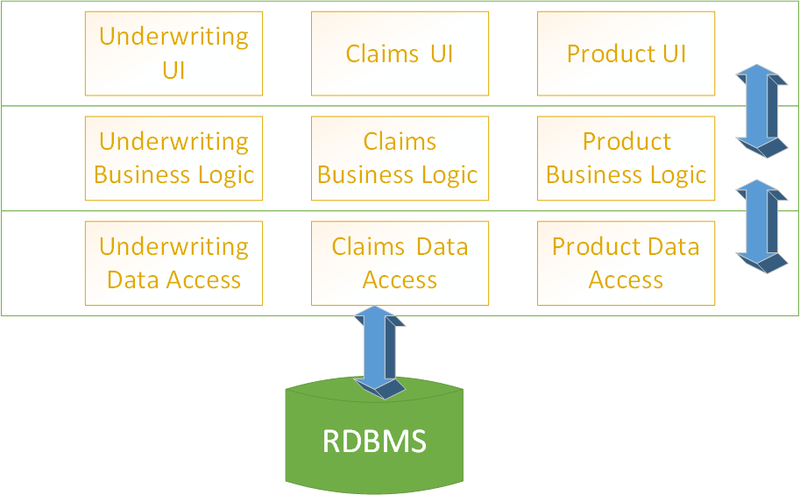 Do you package product module with both underwriting and claims module? That will not be very prudent. Instead, split that out as well and let the other two modules talk to it via some mechanism. In other words, we now have 3 loosely coupled modules to deal with. If you now manage to deploy them separately you can scale them separately. Now you will truly leverage cloud resources. The hardware size now required to scale say the underwriting module is Y and it will be much much less than X which was required earlier. That also means less bill from the cloud provider at the end of the month. The exercise or operation described above is called “Vertical slicing“. This makes microservices autonomous – i.e they can be changed, deployed and scaled independently of each other. Let us now see how the Figure 1, gets transformed with all this. Figure 2 - Microservices emerging from Vertical slicing. In figure 2, vertical columns appear instead of the horizontal layers in figure 1. Each vertical column is a microservice as it is aligned based on business context/capability. Interesting to note that even with microservice the layered cake is present, but is very lean now. Each microservice has its own UI, business logic and data access logic and database arranged in layers. Microservices are can be thought of as vertically sliced, lean layered cake components which work together to compose a bigger application. This makes me think if the microservices is a misnomer. Best name for this would have been "mini-apps". This is because each vertical pillar is a self-contained application in itself. Now the underwriting and claims microservice would definitely need to query the product microservice. Even claims module needs to query underwriting module. Underwriting module, in turn, needs to communicate with party microservice (not shown in the image for simplicity) whenever a new policy is created. In short, microservices cannot function in silos, they must communicate. 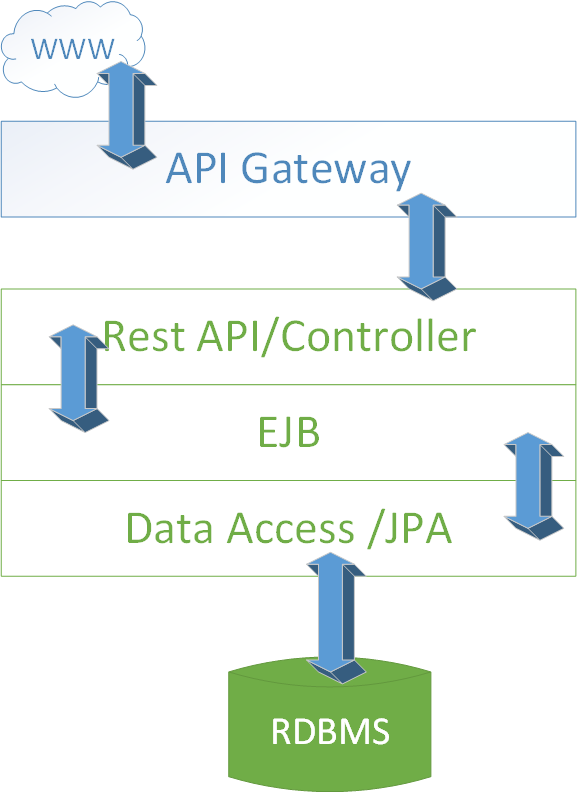 Since microservices widely expose rest endpoints over HTTP, that can be used as the protocol of communication. Microservices can also communicate over asynchronous communication channels like a message system. So, if the deployment of microservices as an individual component on separate processes was not challenging enough, internal communication between microservices over the network escalates that challenge even further. You need a solid business alignment, DevOps support on the cloud (public/private) to successfully build applications based on microservices architecture. Luckily, in 2017, we have exceptional cloud providers like AWS, Azure, Google, DigitalOcean to name a few. Add to that the excellent plethora of continuous delivery tools and containerization options. These two compliments to help implement applications based on microservices. You may think that stars have aligned somehow now to build such loosely coupled applications which we have always wanted for years now. It’s not just scaling needs or support of cloud infrastructure or DevOps tools that’s fueling microservices-based applications. There are other factors as well. Computers have exploded in many form and shapes in the recent past. If laptops, desktops were not enough, you have tablets and mobiles. We are already into the age of wearables (smartphones will soon be a thing of the past in my opinion) and then the best is yet to come with IOT fuelled by 5G – possibly usher a new industrial revolution. This means the applications will not just be accessed by laptops, desktops or phones but there will be a plethora of other clients including robots, drones and maybe even your teeth and hair. This will put tremendous demand/strain on the software applications in the future. Hence, it is imperative for software applications to switch to loosely coupled microservice architecture and gain extreme agility and flexibility. Spring Boot is a great gift for all Spring developers. The productivity boost is enormous. It also makes it extremely easy to unit tests slices of your layered application. This feature is available from Spring Boot 1.4.x onwards. In this post, I am going to focus only on unit testing of Spring MVC classic controller i.e non-REST controller. This tells Spring MVC test framework that we only intend to test EmployeeController So it will only make the web MVC components (controllers, interceptors etc) available with mocking support. For more details of this annotation please refer to the Javadoc here. In the example above, we are testing the request to copy the Employee. Mockito is used to create and inject the mock objects. Spring takes care of the mock objects, dependencies for us. This makes it extremely easy to write unit tests for classic Spring MVC controllers. Note that for quick feedback unit tests must be cheap i.e quick to develop, setup and execute. This goal is achieved very easily with this setup.